Disruptions in the wake of Industry 4.0 are compelling business models to change rapidly and pressuring enterprises to manage these changes in a comprehensive and seamless manner across IT and business operations. Most enterprises, however, realize only partial success in their digital transformation journeys. For an enterprise to scale digitally, it has to go beyond implementing the usual technology-related changes and transform its operating model as well. This change applies to both traditional and digital-native firms, and it begins with the adoption of a digital-native operating model, the goal of which is to establish the right balance between technology and operating model transformation. What benefits can we derive from a transformation focused on the operating model, as much as on technology? What are the key value levers around which we should build the transformation? What are the typical technology changes an enterprise implements as a part of its digital-native transformation? 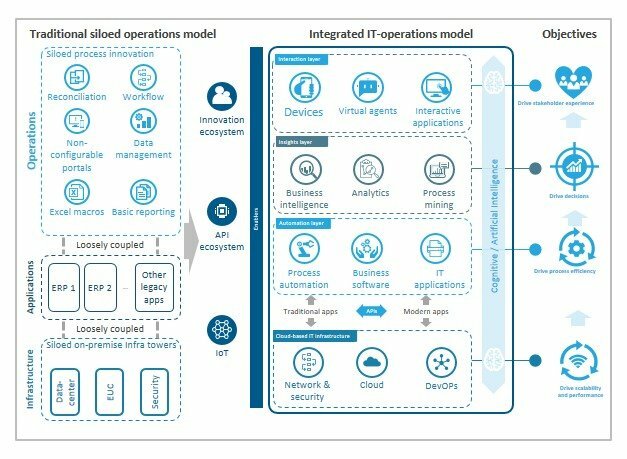 What are the typical operating model changes an enterprise should implement as a part of its digital-native transformation?